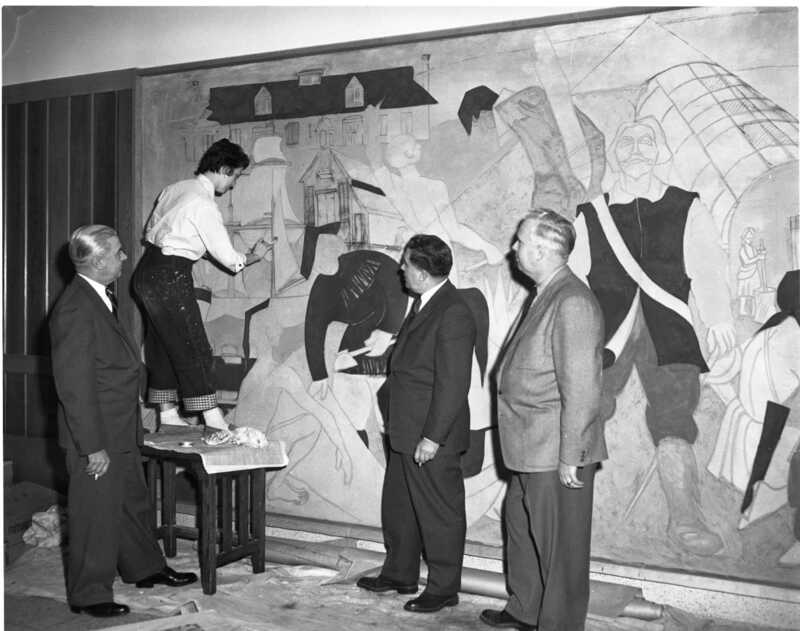 Jane E. Birchall nee Lippert, a young Toronto artist, works on the huge mural that will decorate the main hallway of the new Midland Penetanguishene District High School in Tay Township. School board members Tom M. McCullough, chairman Clarke Edwards and Karl Bertrand look on. Sidewalk superintendents will be happy to see construction begin on the new Loblaw’s Groceteria as the Bell Telephone building is nearly completed. Note how little snow there is in February 1956. Pupils of MPDHS were served their first hot meals from the kitchen of the new school Monday at noon. 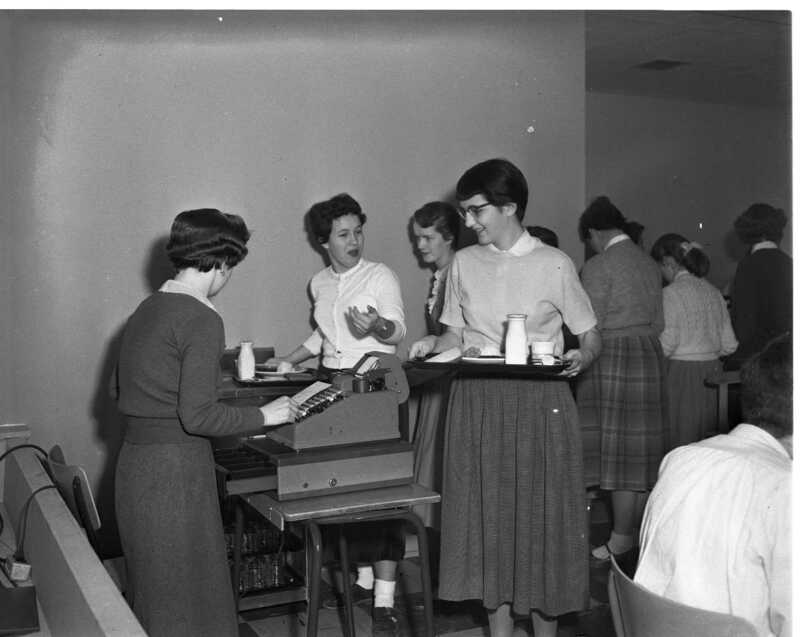 Barbara Piitz of Penetang, on the right, seems pleased with her meal of cube steak, potatoes, carrots, milk and ice cream. Mrs. Bryan Jones, the cashier, totalled the check up to 40 cents. Standard dinner is 25 cents, milk and desserts are extra. This rink will meet the Orillia – Muskoka winner this week for the right to enter the Ontario finals of the Colt’s Competition in Toronto, March 8th. 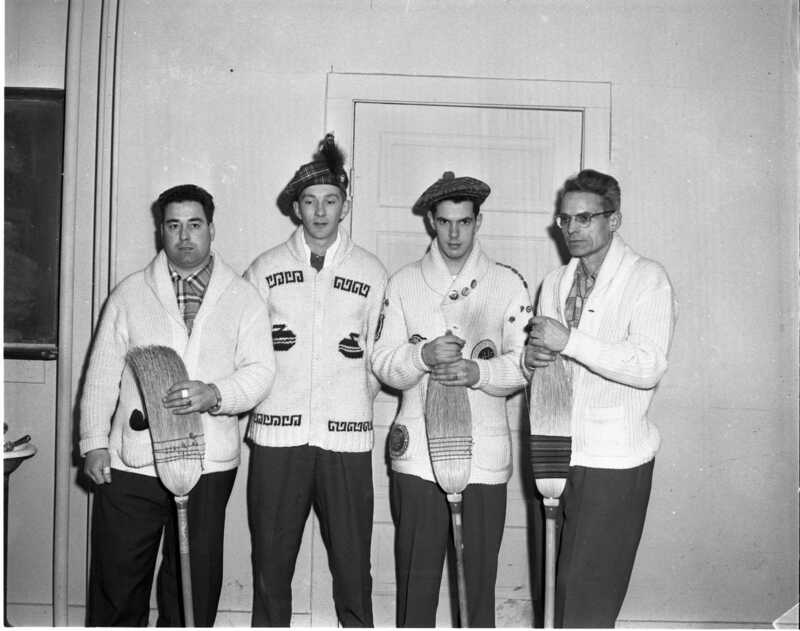 Bill Shields, Ken Gauthier, skip John Scott and Dennis Mohan. Nine rinks took part in the play downs at Midland on Monday. 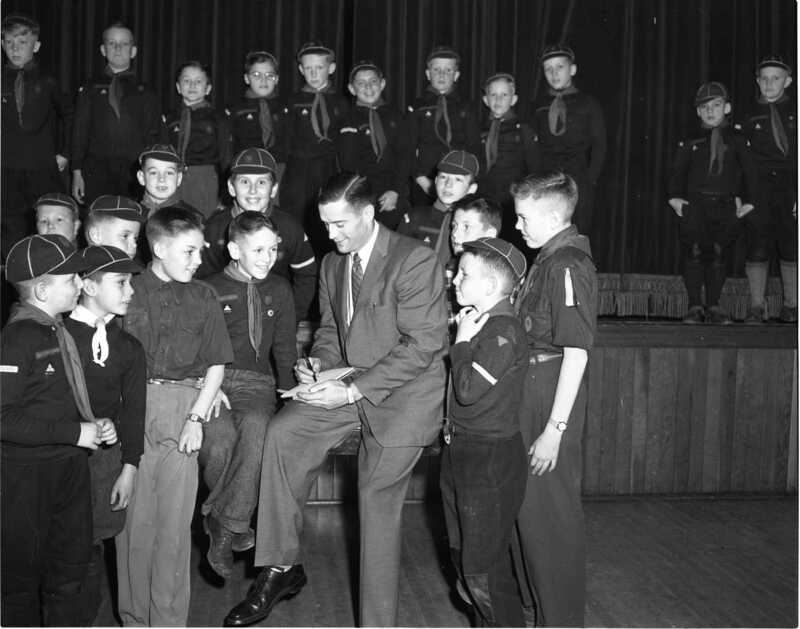 Despite the Toronto Maple Leafs poor standing in the NHL at the moment, there was a warm welcome for defenceman Jim Thompson at the Father and Son Scouting Banquet at St. Mark’s Anglican Parish House. 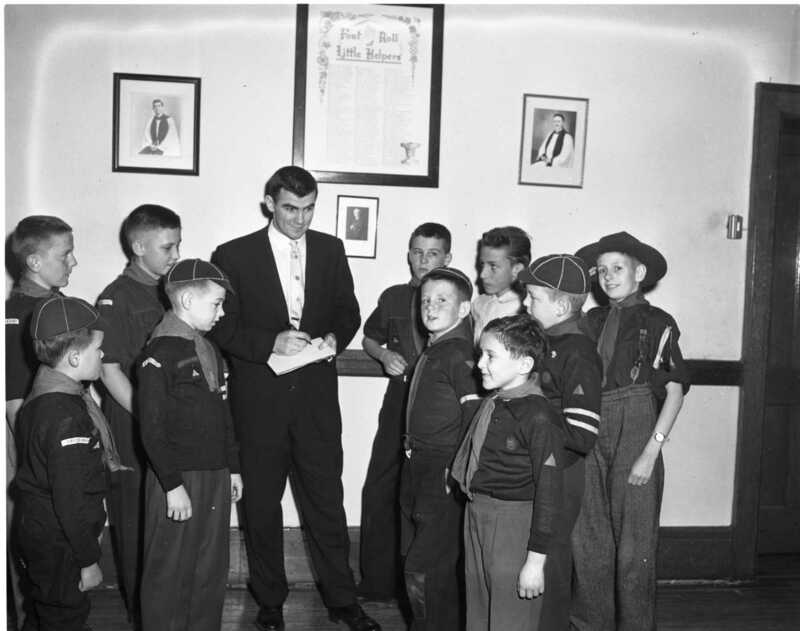 Consistent goal tender for the Toronto Maple Leafs, Tod Sloan is seen here signing autographs for 1st Midland Cubs & Scouts at their annual Father Son Banquet at St. Mark’s Parish House. Elizabeth Holt, daughter of Mr. & Mrs. Bruce Holt and a grade eight pupil at Parkview School was the winner of the spelling bee at Regent School Monday night. The event is sponsored by the Midland Home & School Association. 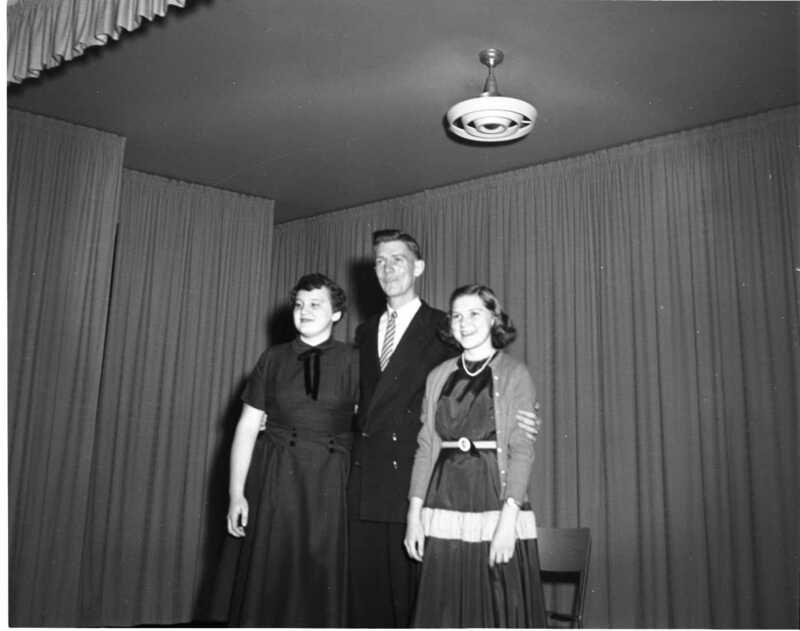 Pictured are Elizabeth (left) with spelling master Jack Yelland and runner up Earla McCuaig, daughter of Mr. & Mrs. E. “Red” McCuaig, a grade eight pupil at Regent School. 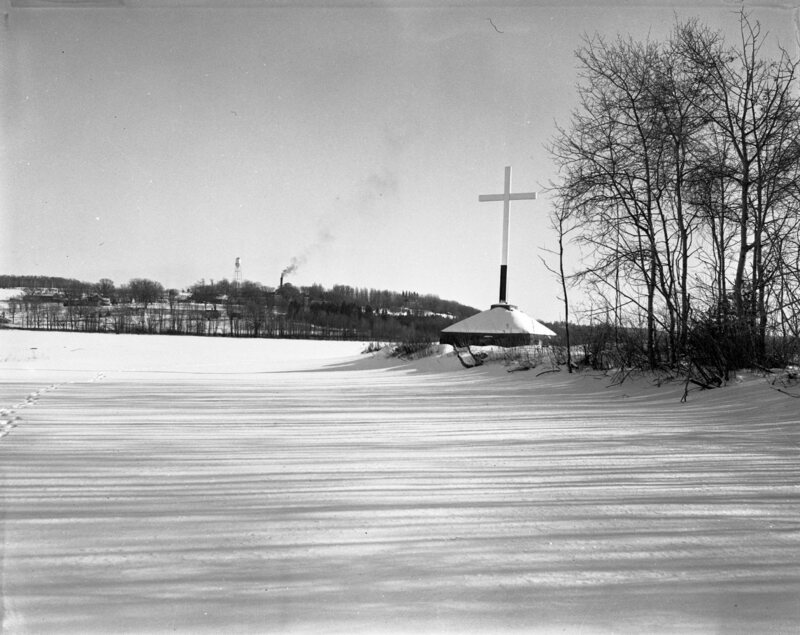 Champlain’s Cross commemorates the arrival of the famed French explorer in 1608. 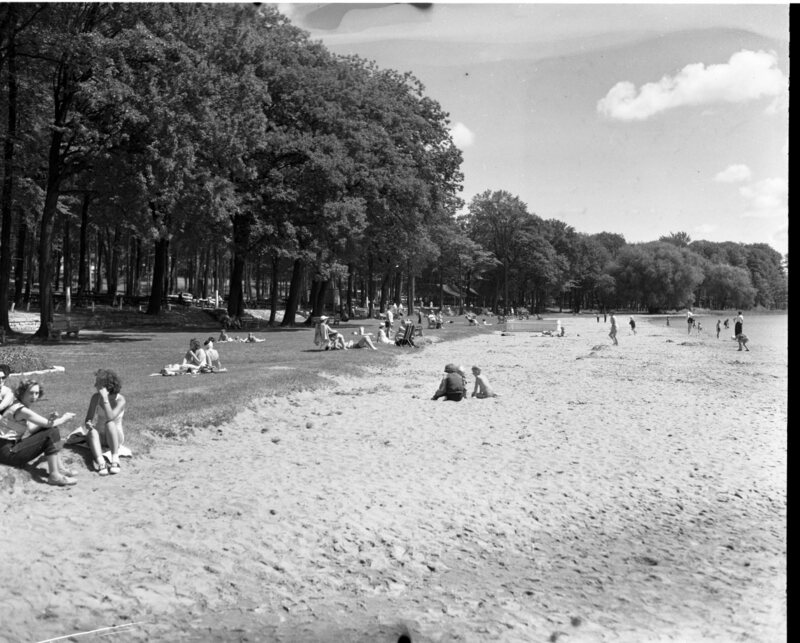 It won’t be long before summer returns to Little Lake Park. The provincial Department of Health has advised Midland Public Utilities that it would have to install a water intake pipe beyond Midland Point before they would approve the bay as a source of water for Midland. The existing open reservoir system is proving inadequate and the town is looking for a new supply. Until a sewage disposal plant is build in Midland the bay water is contaminated by the sewage that empties into it. Where to buy a stamp after the Post Office closes is no longer a problem as a new vending machine has been installed outside the Midland PO. Although you cannot buy a single stamp the unit will dispense twenty five cents worth of postage. Pillsbury buys out its partner in the cake mix business, Kellogg of Canada Ltd. and moves the head office to Midland, states W. H. Pinchin, vice-president and general manager of Pillsbury of Canada Ltd. Mr. Pinchin will direct the cake mix plant in London Ontario and the two Canadian flour mills from his Midland office. A. Robinson, M. P. for Simcoe East, tells a North Simcoe audience that a nationwide health insurance program is close to reality. Y’s Men celebrate their thirtieth anniversary in Midland. Wells and Ange Hartman, Tom McCullough and George Ingram are charter members that are still in the club. F. Taylor, manager of the Royal Bank in Midland is being replaced March 5th by William Mutch from Paisley. Ladies of St. Mark’s Guild stage a vaudeville night to an audience of 300 in the Parish Hall. R. McCarthy, assistant superintendent of elementary education in Ontario supported the demand of the Simcoe County Trustees and Ratepayers Association that children of five years of age are too young to be in the school system. Children are legally allowed to attend school at five in Ontario. Eight school pupils, Louis Jackson and Chief Leonard Monague attended Queen’s Park legislature in full regalia. After walking four and half miles to the mainland the group motored to the Royal Ontario Museum before lunch then were met at Queen’s Park by local member George Johnson and speaker A. W. Downer. The group was given an enthusiastic greeting when introduced to the house. 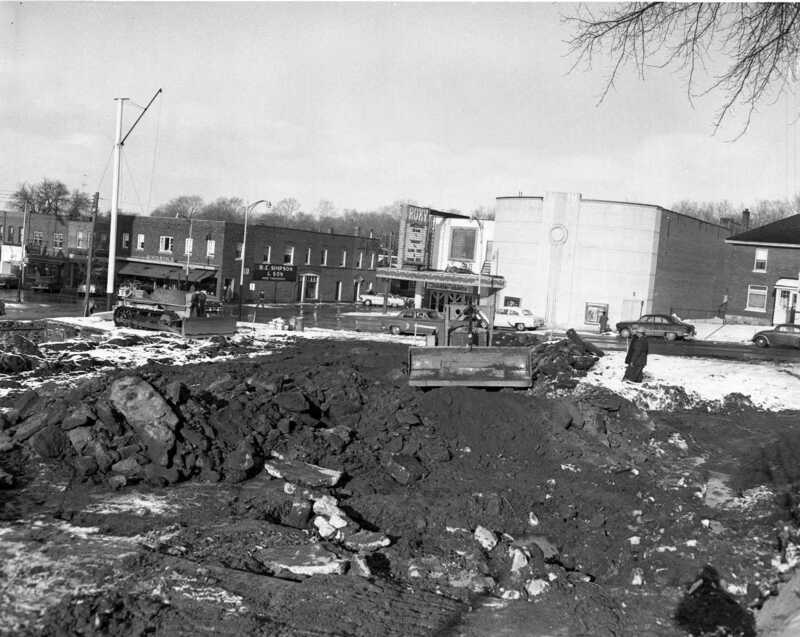 – Midland was having police problems, chief William J. MacDonald had submitted his resignation after 22 years on the force, 20 as chief – council had purchased the new Barber-Green snow loader for $7,950.00 – 35 boys from age 12 to 17 had enrolled in the Boy’s Band under the direction of A. J. Laley – 140 carloads of ice were being shipped from Pot McNicoll to southern Ontario, 35 men were engaged in the work, the ice being 15 inches thick – the Perkinsfield correspondent reported a crow had been seen in the vicinity of the village. Wilbert Stanley Moreau, Victoria Harbour. Mrs. Octave “Rose” Gregoire nee Goneau, Midland. Miss Carrie Lovering, 57, Matchedash, daughter of Mr. & Mrs. George Lovering. Joseph Peter Butineau, infant son of Mr. & Mrs. Gerald Butineau, Midland. Freeman Andrew Vail, CPR employee, survived by his wife Ann Helen Rumley, two sons and two daughters. Sarah Jane Stacey, nee Nicholson, Vasey and Honey Harbour, survived by husband John and six children. William Harris, 97, former CNR employee, Midland and Beeton. William H. Johnston, Penetang, pensioned from Kodak in Toronto, he moved to Penetang ten years ago. George Charles Wilson, has lived in Coldwater for 65 years, was a skilled bricklayer and mason, predeceased by his wife Margaret Ann Lawson in 1917. Veronica Kvasnak, has lived in Port McNicoll for 25 years, survived by husband Steve, son Rudy and daughter Helen, Katie, Ann and Elaine. Frederick T. Stott, Tiny Twp. resident, 84, survived by wife Susan Parnell, sons, Victor and Jack, daughter Anne.